Repsol Honda rider Marc Marquez took his seventh MotoGP pole position on Saturday at the Gran Premio Iveco de Aragon and will aim to return to winning ways in Sunday’s race. 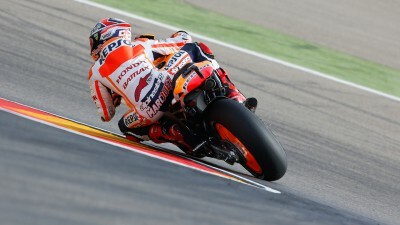 The standings leader recorded a best time of 1'47.804 to comfortably brake Casey Stoner's pole record from 2011 (1'48.451). Marquez waited until the last minute to set his fastest lap, recording the time on lap seven of eight, and beating Jorge Lorenzo to the front spot on the grid by just 0.010s. "It was a very closely fought qualifying session," he commented. "We were able to get maximum performance from the tyres, which was the key to this pole position. Small details decided things this afternoon." "I am happy, because we were able to achieve our aim of a front row start and to have the pole is a bonus. Tomorrow it will be important to get a good start and keep calm in the early laps, with the intention of taking the race to Jorge and Dani (Pedrosa)." For Marquez’ teammate Pedrosa he had hoped for better than third place on the grid and stated, "Even though the position on the grid maybe doesn't reflect it, today we had a good qualifying session. We did a good job today and a lap time that I'm pleased with, for tomorrow the key will be to have a good start as the first corner is very close to the start, so I want to have a strong first few laps and maintain a good pace for the whole race." "The tyre wear will be crucial so it's also important to manage them for the race distance."